Let’s first ask some background questions: Why is knowing, or at least being more aware of the future, so compelling? What makes this kind of inquiry either a curious preoccupation or a vital psychological need? Our Millennial shifts or changes in our awareness can happen any moment. Now is the only time we shall ever truly have. So any over anxiety or sense of dread about what the future could bring is outside of our control, and maybe even outside a good portion of our concern. We constantly reap from the past, as we live, learn, change, and grow in the present. As a continuum, it is by our present thoughts and daily actions, that we sow the potentials and possibilities for the future. Theologically, when reflecting on how we humans approach the future, we can center our focus on the connections between faith and time. The theologian Paul Tillich summarized that theology can be seen as the structure and content of one’s beliefs about life, and that theology flows from or follows closely aligned to or attuned to one’s life experiences. Whether we enjoy the future and what it might bring or just accept the future and what it might hold for us, we can all agree that whether we like it or not, there are very few things we can know for certain. It might be that there is one overarching fact: Things will change. The crucial concern is this; How we respond in faith to those changes will likely determine our attitudes towards change and risk in our lives, and what the future has in store…. Since a pneumatic ( or spirit filled) world view is a vitally alive, ever changing, and potentially transformative one, what would be the importance of having a faith that is grounded in archetypal imagination? How would having a faith that accepts and entertains both the sacred and the profane possibilities that lay beyond either pious orthodoxy or the strictly rational become essential to us? However, valid or true, there is another side to faith that is worthy of our consideration. Psychologically and theologically speaking, the opposite of having faith in the unfolding processes of life, relationships, etc., is believing that you personally have to be in control of what happens to you. The quality of having faith is closely allied with how much trust, courage, or the willingness to risk we possess. The all too prevalent attitude of needing to always be in control displays clearly our lack of faith. In turn, this outlook has become one of the central rationalizations we use for our many insecurities our acquisitiveness, and our possessiveness. It is one of the principal reasons why we humans seek to have power over others. In contrast, a genuine and compassionate faith contains a freedom and a dignity that fosters an equality of relationship; a heart centered trust and promotes a refined relational equipoise that can be healing and joyous. Faith is too restless to be lived out fully without acquiring the anchoring sense of an inner authenticity that gives us a source for our abiding sense of confidence. Faith frames our fullest and most complete understanding of our own motives and guides our decisions. Faith can be reliably demonstrated by how sincerely we choose to believe in something or someone. (The verb to believe comes from the Greek- to be wholeheartedly committed to- that is, without reservations!) From that radical trust, we can learn how best to shape and to live out our ethical actions honestly. From such a faith, we can accept our consequences graciously, and we can continue to trust in the good that can be found through our willingness to engage in that vulnerable and shared process. Each of us also understands that there are also valid and trustworthy emotional, aesthetic, experiential, and visceral ways we can know something as being good, real, true, etc. These less rational but no less important approaches, while admittedly being more unruly and wild within us, yield a vital Eros and positive sense of being more fully alive. These transformative ways befriend The Spirit and can accompany her in ways that can give us positively directed passion for creativity that offers us important and insightful ways to gain the necessary and transformative amounts of life’s wisdom. A pneumatic faith has many dimensions to it- not the least of which is finding both the enduring strength and the lasting sense of vision that keeps one’s sense of purpose alive. Spirit then asks us to discern carefully and wholeheartedly. When a sense of confidence is reached, we are to trust it viscerally and intuitively. This walk around our hearts guides us, and acts as the signposts of the necessary risks and the courageous steps that move each of us towards authenticity. From such a first century and truly timeless faith, Spirit asks us to have courage to choose the unselfish path that leads beyond the ego desires and satisfactions and towards the higher Self, that releases the elevated qualities of Soul. The core of our lives consists of this essential lesson: we are to learn how to incarnate Spirit, learning best to embody the values and virtues of the Spirit- led life. Lastly, we are to live in an applied accord or clear alignment with the God/Spirit of your experience and your knowing. As I currently comprehend its process, a more complete understanding of a pneumatic faith occurs when there is a direct correspondence between your life experience and an inner truth. This quality of faith appears when there is a distinct connection between professing certain values, and then being able to align those values to one’s actions in life. This inner correspondence, is were one finds a generative sense of peace and hope. This is one of our reliable sources for a sustaining sense of individuation or wholeness. Often, one’s inner truth corresponds to an archetypal, universal virtue, value, or vision, but not always…. Sometimes we have to wait, and let whatever wisdom there is to be found unfold itself as we find ourselves being broken down, mixed up, and stirred around in the crucible of our hearts. The rebalancing or restorative calm we need comes only with time, with prayer, and with a trust that eventually holds and then reveals any answers we seek. When I become personally perplexed by life’s questions or when my ability to understand reactions or foresee the outcome becomes blinded by my stubborn thinking, I find that my most reliable source for my solace, and eventually for my best answers, lie outside of the scientific, the mundane, or the logical. It is my lifelong working and unfinished conclusion that it is in the Mythical and the metaphorical, in the imaginative and in the romantic, that we find our expression for what our heart knows or needs. From the ideals I cherish, and the possibilities I accept, more of the truth of my life experiences can be known, resolved, understood. Over my life, this has been proved to be more true that when I would appeal to any logical conclusions based in a detached, aloof, and more methodical approach. As I see it, no amount of common sense, no measure of practicality, efficiency, balanced ledgers, or mathematical proofs will ever yield a complete answer for any of us. The human need for certainty and to find something or someone trustworthy goes beyond appraising external facts. No such secular or soulless approach will suffice! There will always be a need for the spiritual dimension as the crucial and indispensable part of us. The Holy Spirit requires our faith, our trust, and our hope. Then the qualities of Spirit are released to assist us synergistically in finding what is genuinely right and true. The times of our lives can be perplexing and confounding for us. Sometimes it seems as if luck or chance operates easily and that chaos appears inevitable. We protest the loss of our outer sense of control as the social and materialistic creatures we have become. We moderns will make a vigorous appeal to science or banking, medicine or mathematics, for some important foundational answers. Yet, even the best knowledge found in those disciplines does not offer us the kind of concrete assurances we would like them to have for our lives. When we are honest with ourselves, and with the possibilities each of us has for our future, we have to bravely admit that there are too many uncertainties, too twists, turns, too many unintended consequences, etc., that can shape our life experiences in frustrating and disheartening ways. We find that no hard boiled approach to life’s answers can satisfy the yearnings of soul or give the inquiring heart its assurances. Facts are no substitute for truth! While we all occasionally can say life has surprised us, or that we were not ready to change, that outlook brings to mind this wry and telling advice from the Hassidic masters who affirm that we live faithfully in two time zones: in world time, and in God’s time. They long have observed that “only in those who are blind or fearful, does the need for change ever seem abrupt.” We have to admit that change and risk might be the only constants we humans can reliably experience on a daily basis! Potentially, each day will have a component in it that will ask us to deal with risk and then to trust in what we cannot know for sure. Begrudgingly, we know that happenstance and coincidences occur, that accidental events and baffling situations can be seen to work their mischievous synergistic magic to confirm to us that we have limited control over many of the outcomes of our lives. Science and our desire for certainty often blanch or balk at this, and yet reluctantly many of us have to accept that it is true. Increasingly over the recent decades, our contemporary culture has written about the dramatic and idealistic possibilities of cultural change. Accordingly to current forecasts, these changes are thought to commence or to correspond to the date and time that is outlined in the Meso-American Mayan calendar. 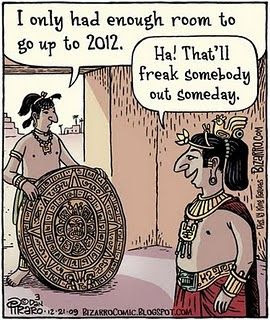 The time when such culturally predictive signs and expected wonders will seemingly occur will be on December 21, 2012. Now it is important to state that this wish for change or cultural transformation is not new! Similar to the previous imaginations and idealistic hopes for a new spiritually inspired social order linked to the Harmonic Convergence in 1987, we can easily trace this American cultural and religious tendency to earlier forms of Protestantism in North America. Our most noteable example would be the Millerites3 in 1834. They were the religious sect who assembled on a New York Mountain-top; It seemed as if there was an expectation of calamity or collapse, of some impending doom, accompanied by celestial catastrophes, and at the end of such tribulation, there would be some arcane but nonetheless some Scripturally predicted and religiously assured form of divine deliverance! Each century, or so it seems, arrives with its own version of a Second Coming! These largely erroneous predictions abound in Western Millennial literature, and are wrapped up in the personal revelations of religious leaders who are “enraptured “4 with their own world-view! Somehow, they are able to cajole and convince their followers into believing in its imminent appearing! Modern media has often been a willing, uncritical, and enthusiastic ally to these controversial and often unfounded assertions. As for the current dire warning about 2012, even the Mayans themselves are at odds with the current rash of books and predictions that offer dramatic warnings and portents of doom. As the long, extended article5 cited in the end notes of this paper names it, our Western Christian understandings of the religious life, its examples and archetypes have been “exhausted.” This observation is one of my key concerns. Our Western religious language has been stripped of its power to proclaim dynamic and transformative messages. Because of this accepted infirmity, and the inability for conventional approaches to Western spirituality to inspire our culture, as I see it, the time is ready, even overripe, for a ” Pentecost” among us…. It is my contention that these changes are not literally connected to a specific time or place; they are not limited to a specific date in calendar or hour of clock time. When we are dealing with all the dire and scary predictions that we have been popularly given, first we have to make objective and scientific allowances for those uncontrollable events such as shifts in the tectonic plates that cause earthquakes, etc. That should quell some of more fantastic fears based on some supernatural punishment or fear. Next, comes the humble and honest admission that there are some events and changes that remain well beyond our human control. This humility and honesty can encourage the responsible and ethical imperative to learn how to cooperate, and to learn how best to prepare ourselves to respond to these cataclysmic events as effectively and as compassionately as we can. I believe that our lives can be activated to receive the spiritual impulses of grace and change, and then we can, as a result of that leavening, act to make those effects evident in our lives. From our individual transformations, we can come together and apply it as a social force within our culture. From this and other such allied points of reasoning, I would boldly conclude that The Spirit, as the dynamis of God, is a constant, ever present, unfolding reality. As such, it is The Spirit that has the capacity to assist humanity in shaping the understanding of its history, and will positively prepare us for its future. Spirit always provides a light along the path for humanity to read and then to savor our next steps in the salvation story. However, it is our participation that is needed. It is up to every person to pay attention! It is required of us to learn how to listen, and then how to reverently and responsibly act on Spirit’ behalf. Given our indispensable gift of free will, and the awesome ethical responsibility to use it for the greater good, it becomes our core task to take the Spirit’ message of wholeness, integrity, and salvation seriously. We are to learn how best to apply those gracious, challenging, and transformative experiences and insights in our lives. Then it is up to each person, reinforced by our churches and spiritual communities, to share these transformative principles broadly among us and across our world culture. From this common knowledge and this shared source of wisdom, we can move consciously towards an inclusive, peaceful, and compassionate future. Spirit acts as our best personal guide and as our best arbitrator for social renewal. She addresses the most intimate and ultimate of our human and social concerns; As one of her ultimate gifts and graces, She connects us to patterns of meaning and depth like no other force or presence in our lives. Whether we are considering the most intimate of our thoughts or feelings, or if we are contemplating the existence of the universe, these patterns can and do present themselves in compelling ways. These synchronistic connections often go beyond ordinary waking consciousness or out beyond the control of societal reinforced ideas. So I will continue by providing an overview of some of these foundational thoughts, and then comment on their possible meaning for us today and into the future. The Age of the Spirit is being avidly and strenuously resisted. It is being blocked by those who wish to stay within their entrenched particular view of theology. It is also being stifled by those who desire to maintain their particular privileged social and monetary priorities that were previously safely defined or elitely preserved. According to both Jung and De Flores, this means that anyone who is willing to remain satisfied with a regressive view or will be satisfied by a more rudimentary faith if that viewpoint secures their comfort and will somehow deflect our personal anxiety or postpone our moral responsibility. There are many convincing examples of staunch resistance. We can find them within our patriarchal or conservative churches, our exclusionary political structures, our privileged financial and industrial establishments, and so on… . There has been a vast investment in time and money, and there is a prevailing toxic need for assurance and rectitude. This resistance has become so compelling for them that they will have to be dragged ” and screaming” into this new age of perception and possibilities. This staunch resistance to social change incites the overall cultural dissatisfactions and extends the feelings of injustice across the lines of class and conscience.. Such current social ferment might well signal the beginnings of a greater cultural alchemy that could easily grow stronger and become more incessant in the coming years. I observe that we live within a creative and gracious chaos. It is our place in time when we can arrogantly pretend to have control or when we can humbly acknowledge the limits of what we can and do control. Reluctantly, our egos have to admit to a larger reality where the timing and the accumulated impact of these environmental events and cultural experiences are often beyond us. Having to accept the larger impinging dimensions and social interactions, brings us to the greater awareness that independence is an enticing illusion. In the Third Age, we will have to be intentionally and purposefully interdependent. When any of us reflects on the long range impact of our many, complex and conflicted governmental or economic decisions- from distant wars to multinational banks, etc., these remote decisions can affect us deeply. No matter how seemingly removed they may be, as citizens, coworkers, and neighbors, their actions become a crucial part of our shared experience of time together. With grace and courage, we learn to move through our lives in the face of these chaotic and uncontrollable occurrences which can and often do become a significant part of our shared future. What speaks directly to my inner questions and that can be used as a helpful barometer or measure of these warnings we daily receive through our media, (even to the impending end of our culture in 2012) comes from our Western tradition and the teachings of Jesus about becoming less concerned with dire warnings, rumors, and impending worrisome predictions. We are taught to accept that a part of discipleship is our lifelong task to be diligent and discerning— to be aware and to be prepared, and to responsibly trust in how God orders the world. Then we are to rest in the wise counsel of Scripture, reason, life experience, and The Spirit’ leading. Even with all of our worldly knowledge at our disposal, many parts of our lives can be influenced and determined in ways that are all beyond our control anyway! Each day requires us to live by faith. Before I speak further about the cultural and interpersonal possibilities, one has to begrudgingly acknowledge that there are many of these sensational, somewhat dire changes that are currently being predicted to occur. According to some predictions, These planetary and climatic ways will move the poles and change its axis! On the geocosmic scale, IF any of these projected changes was to happen, be they asteroids or earthquakes, the operating reality is that there would be only a slight capability that our current society could deter or effectively counter any of these projected large-scale events or results. Maybe there is a particular part of the human psyche or the cultural collective that revels in breeding or promoting such alarm and despair, but I have yet to fathom how it serves the advancement and refinement of self or society! It seems that the overall purpose of this kind of literature and this kind of particularly graphic film is to sell books, consume sugar, and raise movie attendance! It is as if the producers of these books and films have a perverse and immoral delight in creating more panic, anxiety, and fear in the general public! What appears to be so convincing is that is that there is an impressionable portion of our society has been unnecessarily agitated by these unwarranted speculations. These predictions that are based in arcane prophecy- from the obtuse writings of Nostradamus, all the way to the current preoccupation with the Mayan prophecies! Each of these predictive approaches is supported by their own repository of information, which to the undiscerning or the uncritical eye can be taken as fact! Given the exposure that controversial ideas get in our culture, this can result in holding those who are aware of these views in an anxious and suspense-filled curiosity. When we are overwhelmed by such media attention, rather than it function positively as a call to action, it fosters a reactionary fear and greater shared sense of paralysis. The result can be seen in an obstinate sense of cultural entrenchment into all the ways that are traditional and familiar, no matter how dysfunctional, unequal or divisive. When this fear driven retreat becomes generalized, we see evidence of more regressive thinking obtain a stronger foothold; Denial, whether it is expressed, politically, economically or religiously can work to effectively blunt feelings of powerlessness or hopelessness. It is clearly the easier strategy for the human ego and the collective consciousness to choose! Why? Because the personal and community virtues that will be necessary for successfully overcoming these problems in our contemporary culture appear to be in tragic short supply! It will take a genuine courage and a deeply held faith to earnestly work through the various challenges that humanity faces! Precious little good comes from any approach that is fear based. From fear will come aggressive denial. The fact remains that we humans would prefer to feel powerless than to feel responsible for the ethical imbalances in our culture or the ecological crises that we have socially created. If there is any redeeming value to all these current-day warnings and inflamed emotions surrounding the year 2012, it would be that the onus has shifted somewhat away from the all-too-popular and vapid Biblical based, apocalyptic scenarios that have populated the bookshelves and that have been read so eagerly and avidly! With the shift to the Mayan, and the Meso-American calendar as the most recent and compelling portent of tribulation, it seems as if the intellectual burden of dealing with the irrational within Christianity has subsided. All those obnoxious books that extrapolate and extol The Book of Revelations as becoming literally true have finally been replaced! Well, that might be wishful thinking… Let’ say they have been replaced temporarily, in our contemporary consciousness, by a new set of cultural worries, or a newly minted projection of demonic alarm and cultural concern! Nothing our scientists know or no machine we currently possess can safely reverse or reliably cancel the results of earthquakes, asteroids, or even sunspot flares. While we can hold out hope for advances in astrophysics and for ecological engineers that will develop approaches that can forestall any and all of these cataclysmic events, it’ not as likely as reliable or as realistic as we would wishfully admit! Rather than continue to promote a growing sense of impending doom and further promoting the feelings of socio-cultural helplessness, a shift in perception is necessary. What we have before us is the alchemical opportunity and the ethical responsibility to change the basis for our connection to culture and to one another. Feelings of seperateness, excessive individuality, isolation, or disconnection cannot assist us in our survival! What we need is to change our baseline for culture and connection, for relationships and neighborhoods, towards interdependence and a more cooperative plan for our personal and planetary survival! However dire and disturbing these predictions about 2012 can appear to be, there is a greater menace to be faced. The greater tragedy and the larger impact would be to experience our society as being bereft of a transformational God, and to admit reluctantly to one another that we are truly without a sustaining, and courageous sense of hope. ” We are sometimes inclined to think the same things are monotonously repeated over and over again in the history of creation. That is because the season is too long by comparison with the brevity of our individual lives, and the transformation too vast and too inward by comparison with our superficial and restricted outlook, for us to see the progress of what is tirelessly taking place in and through all matter and all spirit. Let us believe in revelation, once and again our faithful support in our most human foreboding. Under the commonplace envelope of things and of all our purified and salvaged efforts, a New Earth is being slowly engendered…. We are constantly forgetting that the supernatural is a ferment, a soul, and not a complete and finished organism. Its role is to transform ‘’ but it cannot do so apart from the matter which nature provides it with…. The expectation of heaven cannot remain alive unless it is incarnate. From Tielhard, I can see the ferment he speaks of in high definition in our world today. What inspires my effort that would agree closely with his visionary ideals is found in the solutions he proposes. They follow the urgings of the Spirit towards cultural interdependence, towards shared regard for the Earth, and for the quality of life for all humankind. These solutions are within our grasp. It is our great and gracious gift to reach out hold one another by the hand and then to fill each other’ hearts with a holy sense of hope. The survival of our planet awaits our faith-filled actions. To have faith above all fears is what is being called for, and such a call is nothing short of vital and necessary! We fully acknowledge that it is our fear that reacts, recoils, and denies our progress or our steps towards meaningful change. We know that it is the heartfelt impulse of faith that makes us capable of a genuine response that confronts the evils found in denial and inertia. When we muster our will to act compassionately, then we can unify our conscious efforts to overcome selfish beliefs and the contradictions in our behavior and cultural attitudes. When spurred on by a sustaining hope for humanity, we can acknowledge that any enduring sense of pessimism is both a deep personal insult and a profound social Injustice. The motivating and vitalizing connection between a revival of our most potent and positive archetypes and the successive advancement of culture and consciousness is the work and purpose of the Holy Spirit within and among us. As this Spirit is willingly shared, applied, and enlivened, She becomes the source of change and the heart-centered hope for our world. It is postulated by soul-centered therapists and clergy that when a person or a culture forgets about the sun and the seasons, they lose contact with the essentials of life- the more heart-centered, empathetic and nurturing ways that make our relationships more enjoyable and that promote a gratitude for life and a quality of love that is more sustainable. Do you feel that our society has lost touch with these seasons and reasons? How can we best recover our souls? Maybe it is that need to recognize and affirm natural ways and cycles of revealed truth that is behind our church membership’s interest in recapturing many of the Native American celebrations, or the Wiccan and Celtic wisdom traditions, that clearly celebrate the seasons with reverence and delight??? Going a little deeper, we can see in the ancient mythical literature a compelling need to look to the Sun and the seasons as ways to unlock and redefine our inner being. Moving to the consideration of the solstice as the longest and shortest days, we are given the contrasting image and the complementary rotations or revolving resonance that represents the changing seasons of the soul. One definition of the cycles of the year and the seasons is this: A year, in the life of day and night, is the way the soul moves, manifests and matures itself. The solstice points are the only time in the whole year that the Sun stays stationary or is seen as standing still. This station can be seen as a time of concentrated self or soul energy that reinforces what you know about yourself and can affirm the next steps in your path to more complete selfhood. make-up- the inner impulse that portrays how we can be attracted to the new search, and they place before us the completion of an important life’s task– These two points give us a special time for expressing and then for integrating what you know about yourself. Lastly, the solstice points are an opportune and gracious time for the recapturing and the reconnecting of your personal and relational missing links- those parts of you that you had previously let go or places in your life where you have felt lacking or that something is missing. The solstice time period offers us the spiritual opportunity that gives us time and energy to reclaim and reconnect them. From these phenomena, we gain insights into our soul life. From these celestial cycles, we find a path to our inner work, our inner release. As the seasons transpire, circling the cosmos in their divinely ordered rounds, we who value renewal and the potentials for self and soul, are urged to align and attune ourselves to these cycles, and adjust ourselves to accepting that we are creatures who need to heed the rhythm and flow of energy and life. Happy Solstice… and may the blessings of the long time Sun be with you! War On Christmas? Sign This Minister Up! Some people wait with bated breath for duck season, some for deer season, but for me it is all about Christmas season. That’s right, I’m one of those lefty liberals that have declared a War on Christmas. Yes! Sign me up for the War on Christmas! But maybe not for the reasons you might imagine. While I am signing up to help in a War on Christmas, I’m not on, what by default gets called, the non-Christian side. Nor I am also not signing up for the side that news pundits falsely purport as the Christian side. If anything, I would make the argument that the dominant face of Christianity, as it is seen on television and promoted through news programming, is itself far from what Christianity is supposed to be. It is a sort-of whitewashed, sanitized version of Christianity that every year presents an increasingly cleaned up version of the Christmas story to the viewing public. You see, the baby we remember this time of year was not part of the dominant culture the way the religion he started now is. The religious stories that were told in those days were told under the shadow of the dominant culture. They were stories of oppression and hardships, stories of overcoming unthinkable odds, stories of hope for a people living in times and cultural positions that, quite frankly felt hopeless. So, a War on Christmas? Sure, sign me up. I’m pretty sure I’d prefer the elimination of what our modern celebration has become to the increasingly whitewashed version we hear every year. The Christmas story has been hijacked by a dominant culture. Places of power and positions of prestige have warped the comeuppance sensibilities of the original Christmas story. God’s vision of liberating the oppressed, the downtrodden, has been slowly replaced year after year with a story that no longer brings fear to the Powers that Be, but rather supports the big business agendas of profit and mass consumerism. A War On Christmas? Come to think of it, they are right. There is a War On Christmas, but the war is actually waged by many of the very people who think Christmas is getting squeezed out of our culture in the name of plurality and other religions. If the Christmas they support wins, I for one, would have to say all is lost. So yes, there is a War on Christmas, and we Christians have been supporting it. If the present day version of Christmas continues to be the dominant version, then I believe a great darkness will smother us in a sea of privilege and perverse oblivion to the struggle of those most in need the oppressed, the downtrodden. If the Christmas Present with it’s full-on worship of consumerism continues to masquerade as Christmas Past, our Christmas Futures will increasingly become times when we give out of our abundance rather than out of a response to need and out of a response to God as love. They will be the kinds of Christmases in which we give to those who already have abundantly while the oppressed, the downtrodden, watch our overindulgence and rightfully judge us by actions which run contrary to our words of a child born to bring light into the dark corners of the world. Isaiah 9:2 The people who have walked in darkness have seen a great light; those who lived in a land of deep darkness, on them light has shined. That should be the dominant message of the Christmas narrative. Is it? Does the way we celebrate Christmas bring light into the darkness? Does it bring hope to the hopeless? Does our modern-day Christmas celebration bring justice to those who have been treated unjustly? If your answer is no, then, whether you knew it or not, you too believe that the Christmas Past has been white-washed by the Christmas Present. During this season, as we remember not only the birth of the light of the world, a child sent to enlighten the darkness, we also remember his words: âNo greater love has anyone than this, that they lay down their life for a friend. As we remember the humble, unassuming way he came into this world, let us not forget that he left this world among thieves, as outsider hanging on a cross in an attempt to teach us something about God’s love. A child born in a manger, no crib for his head, who was sent into this world to teach us something about the value of every human soul, sent in as the least-of-these, born to a poor woman in a borrowed animal stall, sent to teach us that the least of these is simply a human construct created by the insiders to define themselves over and against people they see as somehow less than themselves, sent to show us what a life looks like when it starts from the assumption that all people are worthy of God’s love. This Christmas I wish for you and for me is light in the darkness of the Christmas Present. I wish for us enlightenment from God. I wish for us an enlightenment that helps us see clearly the love for all people that laid in a manger some 2,000 years ago; an enlightenment that encourages us to be a light to those trapped in the darkness of hunger, homelessness, oppression, poverty and war. I wish for us an enlightenment that allows us to see we too have darkness in our lives, an enlightenment that helps us see beyond the cleaned up Christmas of the present to the humble, unassuming beginnings of our religion: a baby King, born to an outsider, born to save the world from darkness. War on Christmas? A war on what Christmas has become? A war on worshiping consumerism in the sacred halls of Wal-Mart, Target, and Best Buy while the world is swallowed up in the darkness of not having enough food to eat, a place to live, clean water to drink, access to reasonable health care? Sign me up, because I refuse to let the story of my faith be co-opted by corporations who only wish to convince us that we are privileged and we do deserve what we have more than other and we should revel in our abundance even as we celebrate the birth of the child who laid in a feeding trough, who lived his life with no place to lay his head, who told us that as you do it unto the least of these so to you do it unto me, a child who gave up his very life that we might understand what true love looks like. War on Christmas? Indeed. Where do I sign up? M. Div. from Wake Forest University’s School of Divinity  and has undergraduate degrees in Business Administration and English with a minor in Computer Science. He’s an ordained minister in the PC(USA) and a self-described progressive.